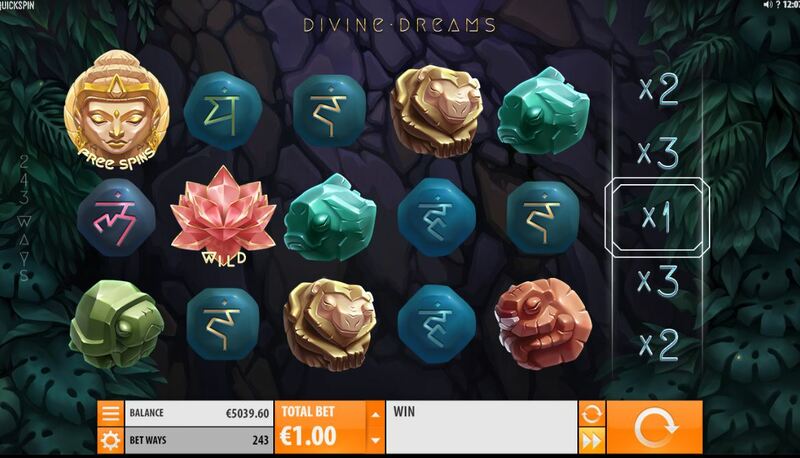 Divine Dreams slot has yet another original mechanic as we've come to expect from this notable Swedish developer. The reels are totally transparent and lie over a cave hidden by foliage and we hear mystical music and a choir of angels as the reels spin. Very soothing and step up in appearance from Netent's Divine Fortune or even their own Ivan and the Immortal King if you like these fantasy themes, which I do. Now if this slot can produce some divine intervention for my bankroll, I will be converted! As Divine Dreams is a 243-way slot there are 5 reels of 3 rows each. Well, that's not strictly true as there is a sixth reel on the right which offers lots of gifts from the Gods but we'll get to that shortly. You can see Lotus Flower Wilds singly on all reels and scatters too but the rest of the standard icons appear both singly and double-stacked. 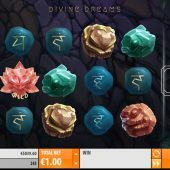 The 5-of-a-kind pays are 15x bet for the Pink Carving, 7.5x Brown, 5x Gold, 4x Green and 3x Turquoise and there are 5 character tiles awarding 2 down to 1x for a full way of 5. These can be seriously enhanced by the final reel though. This spins every game and contains multipliers of 1 to 10x for any wins you may land. There are though 3 in-play awards which can appear instead of multipliers on the reel. Red Tile - Ying Yang Wild which adds 2 Wilds which always seem to count in a win, and thee Wilds will have a random multiplier applied too. Yellow Tile - Super Respin which adds extra Wilds to the reels and then upgrades the multipliers on the reel to a maximum of 30x. Orange Tile - Mega Respin which can only appear during the Super Respin just mentioned. This will award a free spin with extra Wilds and more of the highest multipliers on the reel so 10-30x is far more likely. Quickspin tell us we can get up to 7,200x bet on one spin. If you see 3 or more Buddha scatters you are awarded 8, 12 or 20 free games for 3, 4 or 5 respectively. No retriggers here but you do now see a Blue +3 Spins tile appearing on the Bonus Reel in the free games. It will come as no surprise here that the enhancements applied during the free games are the appearance of far more coloured tiles on that Bonus Reel, to make some of those big hits more likely.